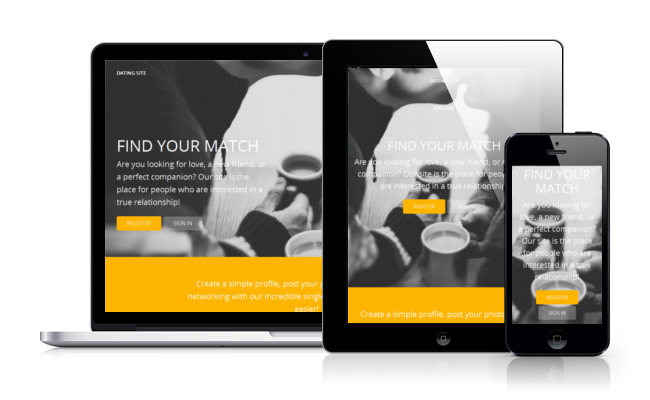 We are happy to announce the new version of the PG Dating Pro software. It is called Honey (2016.8). The main theme has been somewhat predictably updated with a touch of honey-yellow. We hope you like it. The highlight of the Dating Pro Honey is the administration panel improvements. 1. A reponsive design theme that is based on ‘gentelella’ bootstrap template: it allows the site owner to operate the site from desktop as well as from a tablet. 2. A fast navigation option that lets you quickly find admin panel sections by headline keywords. This improvement comes after the feedback from our customers. The fast navigation tool is based on phpMorphy library, and it works with the English, German, and Russian languages. 3. You also have the opportunity to perform moderation duties directly from the admin homepage, no need to go any deeper. The list of moderated objects may include user profiles, uploaded photos, audio and video files, offline payments, abuse reports, and more. You and your team can approve or decline all such objects right then and there. 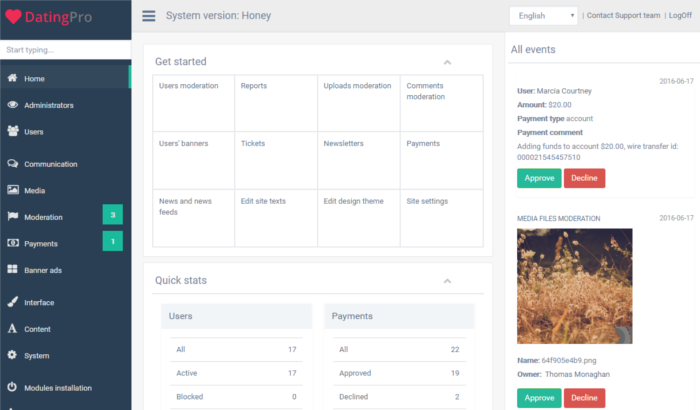 What else is new in the Dating Pro Honey version? Bonuses add-on lets your site members receive bonuses for performing certain actions on the site and convert bonus points into real money. The actions may include uploading photos into gallery, taking part in polls, completing one’s profile to 100%, sending messages in ShoutBox, and more. Special offers add-on is a tool that helps you stimulate sales by creating promo offers like ‘Add money to your account from 4PM till 6PM today, and we will increase the amount by 50 per cent’, or ‘Purchase premium membership on June 25 and receive 1 extra month of premium membership for free’. Events add-on lets you and your site members create events that people can join, comment on, and invite other site members to join and have fun. The event organizer decides whether to allow participants to join without invitation, or to create an exclusive event where people will only be able to join if they have been personally invited. Companions add-on allows people to look for travel companions, or someone to go to a concert or a festival with. The organizer tells where she or he would like to go and who with — a man or a woman, the preferred age range, and whether there are going to be extra costs involved, to be shared or not. The members and visitors of your dating site will appreciate a convenient location selector that we advertised a while ago. We are looking forward to hearing your thoughts and comments! Visit the online demo of the Dating Pro dating script and view it in action here: www.datingpro.com.